Earn $3.79 in VIP credit (379 points)What's This? In keeping with Shimano's habit of trickle-down technology from group to group, this 10-speed Ultegra chain features an asymmetic design just like its Dura-Ace 7900 big sibling. This unique construction consists of differently shaped inner and outer plates. The inner plates are made to mate precisely with Shimano 10-speed cassettes, so shifting into larger cogs is quicker and wears less on the chain and cassette. The outer plates, meanwhile, are mated to the ramps and pins on the large chainring, for faster shifting into the big ring. The larger outer plates also lower the likelihood of chainsuck—the chain falling between the crank and bottom bracket shell. Perforations in the chain save weight without sacrificing strength. This 6701 chain is a few grams lighter than the 6700 that came before it, with even better durability. The CN-6701 Chain uses the standard Shimano 10-speed connecting pin and is compatible with double cranksets only. 116 links. 267 grams. Note: For triple cranksets, we recommend the CN-7801. Installs easily and works great, shifts are smooth. I change my chain when the chain tool says to, and I don't really notice a difference except that everything keeps working. New Shimano 6700 chain works great with a new replacement Shimano 6700 cassette. Both purchased from Bike Tires Direct. No complaints from this happy bike rider. Just a rock solid, well priced, chain. Have been using the Ultegra on all my bikes for years. Clean, lube, replace when my Go, No Go chain checker tells me to. No need to over sell it! I've tried other chains that cost less and was not satisfied.the shimano chain last many miles if you take care of your drive train by cleaning, etc. These chains never fail to exceed its expectations. Tried all the others but always came back to these. Okay the chain works great and is the high quality we expect and get from Shimano. My only caveat is that installation of this chain is not as easy or foolproof as with the SRAM or KMC products. I learned the hard way-the link pin must be inserted correctly or the chain can break. In my case the chain broke as I was climbing a hill, and locked up in the rear derailleur which then tore through the chainstay of my titanium Litespeed on its maiden voyage. A bitter pill for sure, for which I don't blame Shimano. I simply want to warn users of this system that installing this chain correctly is important. Since this disaster I have installed these without a problem and run them on more than one of my bikes, so all good now. But a tough way to learn I hope other buyers avoid. I learned the hard way that 10 speed chains need more frequent cleaning than ancient 5 & 6 speed chains AND that you MUST read the manual. You must not break the chain and reuse the pin as we did years ago. That said - what a relief to return to quiet reliable shifting. From the amount of stretch over the past 900 miles on the identical chain I'm going to guess that I'll get about 2500 miles before replacing it with the chain I just bought. I purchased this for the price was right and sticking with Shimano ultegra items with ultegra gears only makes sense for they fit well together. I guess a chain could be awesome but not sure. Got this one to replace worn Dura Ace chain on rain bike. New chain works great. And the price was extremely reasonable. In fact I sold some Dura Ace 10 speed chains (new) on eBay, bought and extra one of these and had extra $$$ in my pocket afterward. That's a win-win!!!! It's Shimano! What else needs to be said! A great chain for a great price. Keeps the wheels turning! 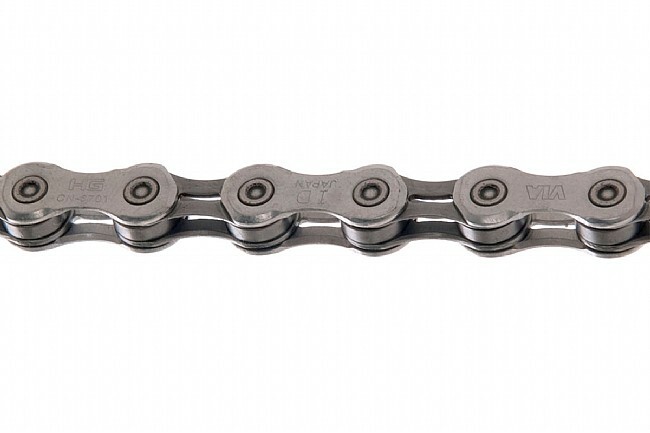 It seems like there is no longer a Shimano CN-7901 10-Speed Chain available for purchase. When I received this chain the box states its for Dura-Ace, Ultegra and 105 10-Speed drive trains. Its a bit confusing but the price on the so called Ultegra chain is affordable. I guess I can now just replace my chain more often. My bigger concern is that Shimano apparently is abandoning continued 10-Speed component support. This has a single pin closure and if the length is wrong you have to punch out links but there is no link to re-attach. Noticably smoother shifts...lighter weight...easy cut and fit...Shimano quality! Always good to have a backup ready. Chain performs above expectations. Entire drivetrain is smoother shift and is unbelievably quiet. More durable than 105, cheaper than Dura-Ace by alot, same performance. More durable than 105, performs like Dura-Ace at a much lower price. Save more, buy on sale.. If you're tired of looking for the weakest link (I always wanted to use that phrase in a sentence . . .) then perhaps its time to replace/upgrade your chain! I have two bicycles with Shimano 10 speed components (105 and Ultegra ) and opted to replace the chain and cassette, swapping the 105 components for Ultegra. This was a no-brainer . . . great components at a phenomenal price! You really can't go wrong with the Shimano Ultra CN6701 chain - replace your chain today! I use this chain with my 2 bikes with RotorQ Rings rings as well as one with Di2. Of all the chains I used this one shift the best and last the longest.